One of the benefits of being fortunate enough to work here at the APRL is that every once in a while an opportunity comes along to attend an event that is truly unique to the world of philately. 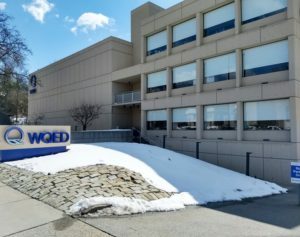 One such opportunity came recently with the chance to attend the Mister Rogers first day ceremony this past Friday, March 23, at the WQED-TV PBS Studios in Pittsburgh, Pennsylvania. Before I started working at the APRL in December, the majority of my knowledge about stamp collecting came from Terry Pratchett’s book, Going Postal. 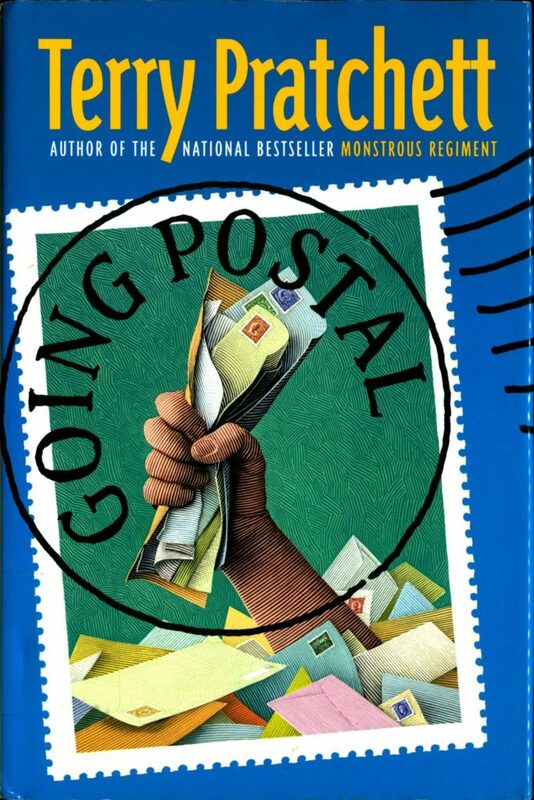 As a teenager I was a huge fan of Pratchett’s humorous fantasy books set in the fictional Discworld, and Going Postal was one of my favorites. When I arrived at the APRL I was glad to see that the book was included in the library’s collection. Most postal historians know that ZIP codes were created by the U.S. Post Office Department in 1963 to make the delivery of increasing volumes of mail more efficient. These Zone Improvement Plan codes were never intended to be used for anything but mail delivery. They were created with the post office in mind, not neighborhoods or communities. However, they’re frequently used as a proxy for neighborhoods for statistical purposes. For example, if you visit the U.S. Census Bureau’s American FactFinder, the search box prompts you to enter a state, county, city, town, or zip code. A recent article from ThoughtCo. examines the use of ZIP codes as proxies for neighborhoods and the implications (along with some fun facts about ZIP codes). As the Postal Service handles the holiday mail, Smithsonian.com looks at the Remote Encoding Center and how its staff work to decipher addresses that machines can’t read, either due to damage or unique handwriting. Read the full article at Smithsonian.com. The American Philatelic Research Library regularly lends up to five books by mail to APS members wherever the U.S. Postal Service can reach them. This standard five-week loan by mail allows for time in transit. If seven weeks go by and the books have not been returned, we take the first steps to get them back. Seven weeks and five days in transit? It was my turn to be amazed. No wonder he’s interested in Intercontinental Airmails! A letter, post-marked at Manchester, N.H., arrived at the Portland post-office last week, bearing the following direction:—”The youngest, unmarried, blue-eyed lawyer in Portland, Maine.” Wonder what were its contents. Wonder, indeed, what were its contents—and where the Portland post office delivered the letter! One of the world’s first Christmas cards sold at a British auction for more than $6,800 on Saturday, according to a report on TODAY.com. 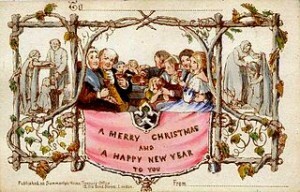 The card is an 1843 design produced by Sir Henry Cole, who also worked with Rowland Hill on the Penny Black. The APRL has a collection of early 20th-century greeting cards. Last week, we asked in our trivia question which breakfast cereal lent its name to a postal forgery operation. William Harnish correctly guess cornflakes and pointed to a Wikipedia article about the operation. 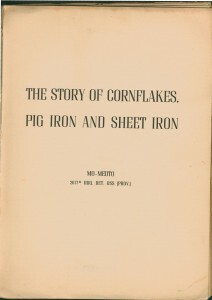 I thought of the question because of a publication that we just cataloged called The Story of Cornflakes, Pig Iron and Sheet Iron. The report was published in Rome in May 1945 and contains a written report as well as photos. What breakfast cereal gave its name to a postal forgery operation? Which “dead” country’s stamps are still valid for postage? Post your answer in the comments.